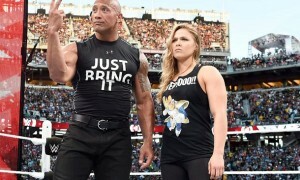 The 5-18-12 edition of Friday Night Smackdown! 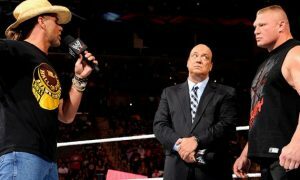 kicks off with footage from this past Monday night, where John Cena basically gave away the ending of his match with John Laurinaitis this Sunday at Over the Limit when a bunch of stipulations were added that will seemingly give Cena all the advantages, yet will actually cost him when former employee The Big Show will interfere on Ace’s behalf. Count on it. Speaking of Ace, he makes his way down to the ring, and says he respectfully disagrees with the Board of Directors’ decisions regarding the match. This Sunday, it’s like leading a lamb to slaughter, and that’s not fair. He’s approaching 40 years old, and he’s not as flexible as he used to be. He can still bench 250 pounds and run a mile in 6 minutes, but that does not qualify him to compete against John Cena. He asked the Board to reconsider, and they said no. So, he’s now asking all of the fans to support him. He doesn’t expect them to cheer him, but he will ask them tonight, when they lay down to go to sleep, say a prayer for him. We hear CM Punk’s music, and the WWE Champion makes his way down to the ring. Doesn’t Johnny get it? Everyone already has been praying. Those prayers have been answered. The only way Ace can win on Sunday is by pinfall or submission. If anyone interferes on his behalf, they’re terminated. And, not if, but when Cena beats him, he gets terminated. Punk would like to wish him best of luck in his future endeavors in advance. Punk plans a big party for next Friday night when Ace has been fired. Does Ace realize how miserable he makes people? On RAW, he made a 7-foot giant get on his knees, grovel and beg for forgiveness, with a smile on his face. He constantly insults the intelligence of the WWE Universe, and humiliated Teddy Long in the process. Ace says he’s still the GM and can do what he wants until at least this Sunday, making a match for tonight between Punk and Kane. Punk says he won’t pretend he’s not concerned about the match, but he also won’t run to the Board like a coward because he’s a man. He respects Kane, something he can’t say about Ace. This time next week, he’ll still be the WWE Champion, and Ace will be at the back of the unemployment line. As Punk leaves, Ace screams at the crowd for people liking it when someone makes fun of their boss. He’s been tough, but fair as the GM, but the fans don’t get it. He works hard for us, but the harder he works, the more we like to crap all over him. He’s not going to blame Cena or Punk for their actions; he’s going to blame all of us for supporting what they say and do. He detests us all, and if this is his last night on Smackdown!, he has some parting words: everyone can go to hell. Did You Know? The oldest known living organism on Earth is a Bristlecone Pine tree named “Methuselah”, estimated to be 4,843 years old this year. Sweet afro clip for Soul Man here tonight, despite the fact that he has no afro. Young starts off with R-Truth in a tie-up, with Young backing Truth into the corner. Young hits a few knees to the midsection, but misses a clothesline. Truth fires off some punches and tags in Kingston, who hits a springboard cross body for 2. Young reverses a corner whip, but Kingston counters with the pendulum kick. O’Neil gets kicked away off a distraction, allowing Young to slide out and hit a back suplex on the ring apron. Back in the ring, Young gets a 2-count before tagging in O’Neil. O’Neil with a bodyslam and a corner whip before hitting an avalanche. Kingston gets his feet up on the second attempt, and both guys are down. Both tag out, with Truth hitting first with punches. Truth hits the Lie Detector and a DDT for 2, but O’Neil breaks it up. Kingston and Truth hit a double dropkick on O’Neil, sending him to the floor. He follows up with a plancha to the floor as Truth hits the What’s Up on Young for the 3. WINNERS: Kofi Kingston and R-Truth. After a “B.A. 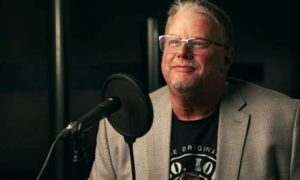 Star” video, we see Zack Ryder in the back starting to film an episode of “Z! Long Island True Story” as Damien Sandow walks by. Sandow stares at him, shakes his head and walks away towards the ring. Sandow has the best music ever. Before the match, Sandow wants to beg our indulgence for just a moment. He introduces himself and is here to help us all. It is his passion to set us free from the chains of ignorance. One fortnight ago, he stood upon the precipice of a “New Era of Enlightenment”. However, when he got to ringside, he was faced with an unfit opponent, one he rejected as not to bore us with such an abhorrent contest. Sadly, he finds himself in the same situation again. Tatsu is an unworthy opponent, therefore he cannot and will not engage this ignoramus this evening. As always, he does this for the benefit and well-being for us all. You’re welcome. Tatsu grabs the microphone and calls Sandow a chicken before making chicken noises. As he turns his back, Sandow attacks him, grabbing him in a full nelson and slamming his face into the turnbuckle. After a couple knees to the face, Sandow hits a straightjacket neckbreaker (think William Regal’s “Union Jack” or Gail Kim’s “Happy Ending”) before leaving the ring to calm himself as his awesome music once again blares. WINNER: No contest. Future World Champion in Sandow, without question. We get some video from last week involving the four participants in this Sunday’s World title match, as well as footage from Monday night. In the back, Matt Striker is with Randy Orton and Sheamus, who go one-on-one tonight. Sheamus is looking forward to the 4-way match, as it provides him a challenge. He’s a hothead, but can harness that aggression in the ring. That’s why he’s the champion, unlike some people. 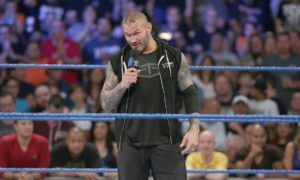 Orton says that, like one of his opponents, he used to be overconfident, and it made him look like an idiot. He could beat anyone in the match, but he wants to beat Sheamus. Sheamus is glad one opponent had the guts to say something to his face. He could Brogue Kick that guy right now, but he won’t because he’s such a nice guy. Orton says that, unlike him, Sheamus IS a nice guy, and we all know how nice guys finish. Tie-up to start, with Ryder backing Bryan into the corner. Bryan hits a forearm and a European uppercut. A kneedrop to the back of the head gets 2. Ryder fights back with some punches, but Bryan lands another uppercut. Ryder hits a facebuster off the ropes before running right into a kitchen sink. Bryan screams “Yes!” before nailing a corner dropkick for 2. Bryan with a hammerlock/wristlock combination, but Ryder won’t tap. He manages to get to his feet as Bryan goes back to the hammerlock. Ryder ducks a clothesline and stops short of a roundhouse kick before nailing a dropkick from the middle rope. He misses the Broski Boot as Bryan trips him, and Bryan goes to town on him with some kicks before ending it with the Yes! Lock. WINNER: Daniel Bryan. As if I needed to tell you, Bryan/Punk will be the show stealer this Sunday. After the break, we see Daniel Bryan is still at ringside, and will be doing color commentary for the next match. Punk starts with a side headlock into an arm wringer. Kane quickly takes him down with a shoulderblock. Punk begins kicking the legs, but Kane backs him into a corner and repeatedly pie-faces him. Punk fires back with some forearms before clotheslining him over the top rope to the floor. Commercials. Back from commercials, Punk is still in control, working over Kane’s legs with kicks before landing a DDT for 1. Punk continues to work the legs, putting Kane in a figure-4. Kane breaks free with some punches before kicking Punk off, sending him to the floor. Kane grabs Punk, and receives a hotshot. Punk goes for a springboard, but jumps right into an uppercut from Kane. Punk winds up underneath the bottom turnbuckle, and Kane dropkicks him into the ringpost. Kane goes outside to stretch Punk around the post before getting back in the ring and hitting some shoulder thrusts in the corner. A punch to the side of the head knocks Punk down for 2. Kane picks him back up and locks in a bearhug. Punk fights out with some elbows to the head, but runs into a backbreaker for another 2. Kane locks in a bodyscissors, working on the injured ribs. Punk sits up, and Kane begins headbutting him in the back of the head. Punk lands some back elbows to break free, then fires off several punches and kicks. Kane catches him for the chokeslam, but Punk reverses into a swinging neckbreaker for 2. Kane shoves Punk off, but misses a corner charge. Punk lands the Pepsi One, with Kane shoving him off on the bulldog attempt. Punk lands in the corner, and gets his feet up on the charge before hitting a middle rope bulldog for 2. Springboard clothesline gets another 2. Punk goes for the GTS, but his ribs hurt too much. Kane slides out and hits a big boot for 2. Kane sets Punk up for a superplex, and Punk fights his way out. Kane goes crashing to the mat, and Punk lands the Savage Elbow for 2 before immediately turning it into the Anaconda Vice. Kane powers out and hits a sidewalk slam for 2. Kane goes up top for the non-flying clothesline and connects as Bryan calls this “100% fantastic”. Kind of agree, as this has been a solid match. Kane looks for the chokeslam, but Punk roundhouses him right to the head, sending Kane to the floor. Punk follows up with a suicide dive, landing near the announce desk. Bryan grabs a chair and looks to crack Punk, but Punk sees it coming. Instead, Bryan lands a chairshot to Kane, causing the DQ. WINNER VIA DISQUALIFICATION: Kane. As Kane gets up, he sees Punk holding the chair, thinking Punk hit him. Kane uppercuts Punk before landing several chair shots to the back. Kane rams Punk into the barricade before throwing him back in the ring for the chokeslam. Bryan is crouched at the top of the stage, watching all of this with a smile. Kane hits another chokeslam as Bryan is now applauding. Well, this was the best match Kane has had in a long time, thanks to Punk, and they finally did some build to the Punk/Bryan match for this Sunday, which had been severely lacking. Up next, it’s champion vs. champion as Santino Marella takes on Cody Rhodes. We get a cut-away promo from Marella, talking about how much he loves the U.S. title. Rhodes starts with a side headlock into a hammerlock. Marella reverses, into his own, and Rhodes reverses into a front chancery. Rhodes lands some punches and a couple of Val Venis kneelifts. More punches and kicks before Rhodes backs him into the corner. Rhodes goes for a moonsault, but Marella moves out of the way. He sets up for the Cobra, but Rhodes lands a dropkick for 2. Rhodes with some punches. Marella ducks a clothesline and quickly hits the Cobra off the ropes, getting the 3. WINNER: Santino Marella. Surprised by the finish. I have a feeling this feud could continue. Did You Know? The name “Spam” was created in 1937 when Hormel hosted a contest to come up with a better name for the product. The winner, Kenneth Daigneau, came up with the name by simply shortening the actual name for the meat, “spiced ham”. Tie-up to start, with the two going back and forth across the corners. They eventually get a clean break. Sheamus goes into a side headlock, and Orton throws him off. Sheamus shoulders him down, but runs into a dropkick for 2. Orton begins working over the left arm with an armbar. Sheamus backs him into a corner again, grinding him in the face with a forearm. They shove each other, then begin trading kicks and punches. Orton blocks a hip toss and clotheslines Sheamus down before doing the Garvin Stomp. Orton misses the jumping knee, and Sheamus levels him with a clothesline. Sheamus punches Orton in the corner, who reverses into punches of his own. Sheamus reverses, as does Orton again. Orton hits a clothesline out of the corner before sending Sheamus to the floor with a clothesline over the top rope. Sheamus drags Orton to the floor. Orton hits a couple punches before Sheamus sends him shoulder-first into the steps. Orton shoves the top steps off before climbing onto the bottom set. Sheamus tries for a Brogue Kick against the post, but Orton ducks and slams Sheamus’ arm into the post before slamming it into the steps a few times and stomping it against the steps. Commercials. Back from the break, Orton is still in control, working over the arm of Sheamus against the ring apron. Back in the ring, Sheamus fights back with punches. Orton ducks an Irish Hammer and hits an armbar takedown for 2. Sheamus tries to fight back up, but Orton takes him down with a quick jerk to the arm. Arm-scissors stomp by Orton, and Sheamus crawls to the corner. He starts to come back with some punches, but Orton sends him shoulder-first into the turnbuckles for another 2. Orton drapes Sheamus over the middle rope and puts him in a hammerlock over the rope. Orton with a few stomps to the back of the arm, but Sheamus sidesteps him coming in and sends him to the floor through the ropes. Orton gets back up on the ropes, and Sheamus nails him with a running knee lift coming in. Sheamus ties Orton up in the ropes and hits the forearms to the chest before shouldering him off the apron and into the barricade. Commercials. We get a commercial for a SyFy original movie called “American Warships”, and it has Carl Weathers in it. He buys all of his cars at police auctions. Back from the break, Sheamus is dropping repeated knees on the head of Orton, but only gets 2 on the pin attempt. Sheamus goes into a modified rear chinlock. Orton fights his way out, but runs into a kitchen sink off the ropes for 2. He picks Orton up on his shoulders and hits the rolling fireman’s carry slam. He signals for the Celtic Cross and begins to set Orton up, but Orton slides out and lands the 3.0. Orton with a pair of clotheslines and a powerslam. I hate that sequence. He runs into a back elbow from Sheamus, but comes back with a belly-to-belly suplex. He’s stealing from Angle again. Orton goes for the suspended DDT, but Sheamus counters with a hotshot. Sheamus hits the slingshot shoulderblock, followed by a pair of Irish Hammers, a shoulder in the corner, a running knee lift and a tilt-a-whirl powerslam for 2. Sheamus sets up for the Irish Curse, and Orton punches his way out. Orton tries a clothesline, but Sheamus catches the Irish Curse this time for 2. Sheamus goes up top for the Battering Ram, but Orton crotches him before hitting the superplex for 2. Both are back up, and Orton stays in control with some punches. Sheamus fires back, and now they’re just trading punches to the head. Sheamus shoulders Orton into the corner and hits a few back elbows. He looks for the Brogue Kick, but Orton moves and Sheamus gets crotched on the middle rope, sending him to the apron. Orton hits the Suspended DDT and signals for the RKO. Sheamus blocks the attempt. Orton ducks a Brogue Kick and tries for the RKO again, and Sheamus quickly counters into a schoolboy for the 3. WINNER: Sheamus. Very nice sequence at the end of the match. After the match, Orton asks for a handshake, but Sheamus isn’t buying it. They talk some trash before Orton extends the hand again. Sheamus accepts it this time, and shock of shocks, Orton nails the RKO.